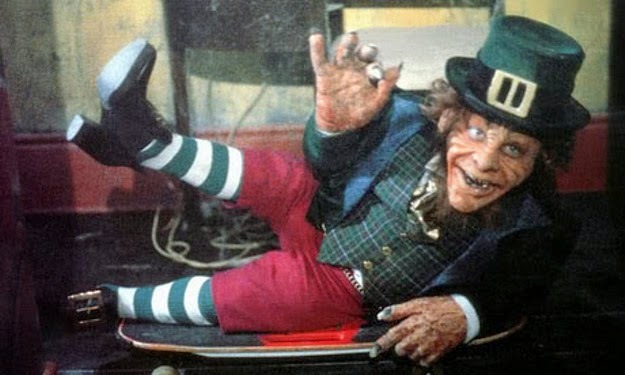 The origins term leprechaun (Modern Irish: leipreachán) remains unclear but it thought to have came from the Irish word “lupracan” which evolved from the Old Irish word “luchorpan” meaning, a very small body. It first appears in the English language about 1604 in Middleton and Dekker's The Honest Whore. The original meaning was of some kind of spirit which was not specifically associated with the Irish mythological character. Some alternative spellings of the word leprechaun that have been used throughout the ages are; leprechawn, lepracaun and lubberkin. Others believe the name is contrived from the Irish, leath bhrogan or shoe maker. 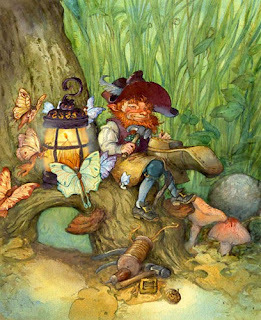 Leprechauns were shoe makers or cobblers and when seen were always making or mending a single shoe. The shoe was a fairy shoe. Oral history is full of tales of the Little people but are difficult to date the earliest reference to leprechauns is in the tale 'The Death of Fergus Mac Leite' which was composed about 1100 ad. This tale was supposed to gave Johnathan Swift his inspiration for 'Gulliver's Travels'. 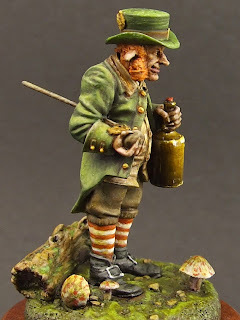 Leprechauns are Ireland’s national fairy and were thought to have come from the north Leinster area. 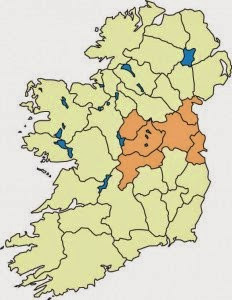 This lies in the south east of Southern Ireland and comprises the counties of Carlow, Dublin, Kildare, Kilkenny, Laois, Longford, Louth, Meath, Offaly, Westmeath, Wexford and Wicklow. They are a class of "faerie folk" associated in Irish mythology and folklore, as with all faeries, with the Tuatha Dé Danann and other quasi-historical races said to have inhabited Ireland before the arrival of the Celts. There are two groups of leprechauns i.e. leprechaune and cluricaun, both enjoy partaking in mischief. Leprechauns are quite often seen by humans although they like solitude and appear after rain and at night. They are described as bespectackled, old men, well dressed in old-fashioned clothes with a cap, leather apron, and buckled shoes. 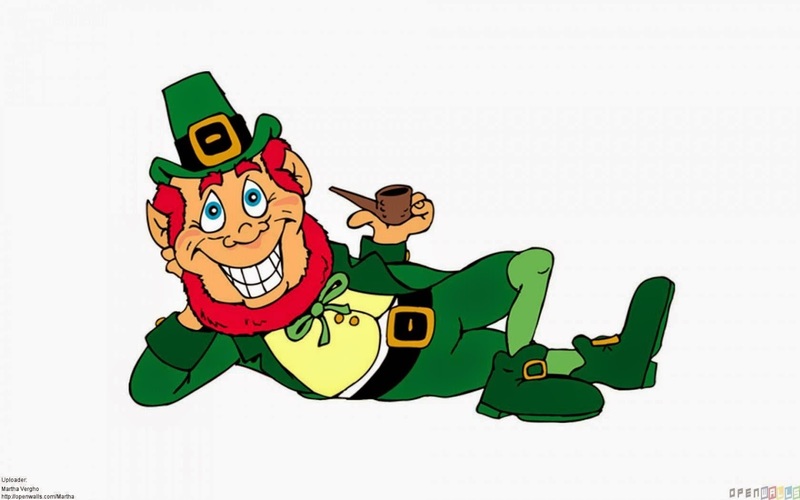 In the 19th century Leprechauns were described as dressed in red whereas green clothing replaced the traditional red and the modern leprechaun wore a red hat. They are two foot tall. Traditionally Leprechauns were sly and malicious and definitely not to be trusted by a mortal but modern interpretation has them as afflable types. They were also very fond of the drink and could become real mischief makers. Leprechauns were shoe makers for the fairies and could hold their grog, (a home brew made from heather, unusual herbs and cereals, called poteen), and no matter how drunk they got they could still handle a hammer without affecting their work. Over the years they developed dexterity, strength, leathery impenetrable skin, remarkably thick ear lobes, enlarged organs, and a flighty fear of humans.Leprechauns are usually old man and said to be very rich with many treasure crocks buried in the country side. Leprechaun always carries two leather pouches. In one there is a silver shilling, a magical coin that returns to the purse each time it is paid out. In the other he carries a gold coin which he uses to try and bribe his way out of difficult situations. This coin usually turns to leaves or ashes once the leprechaun has parted with it. When speaking to a leprechaun you must always keep your eye fixed upon them, otherwise take your eyes off him and he will dissapear. In the leprechaun culture there is no difference between commerce and thievery, to them they are one of the same. Small in stature with characturesque features, typical Leprechauns are strong willed and very skillful. They keep to themselves, appearing only in darkness and after rains. There are frightened of water and never wash, yet stay remarkably clean. Of the fairies they have the greatest ability to vanish. Cluricans can never be trusted and steal anything. The following is a description of a clurican from the 19th century. Leather apron - shoe in his lap..